Japanese Episode AG 020: "Muro Jimu! Naminori Jimu Riida Touki Toujou!" American Episode 292: "Brave the Wave"
Now that Satoshi has arrived in Muro Town, he is eager to compete for his second badge. He wastes no time in finding the gym, but the Muro Town Gym Leader, Touki, isn't the type of trainer Satoshi expects. Touki rejects Satoshi's challenge in favor of surfing, which angers the trainer from Masara Town. After a number of failed (yet persistent) attempts to get a gym battle out of Touki, the Rocket-Dan appear to kidnap Pikachu. Touki's Makunoshita manages to save it, enabling Pikachu to show off how powerful it is. Touki finally decides to battle, so the group returns to the start a gym match. An overconfident Satoshi sends his Subame to face against Touki's Wanriki, who endures a number of attacks before scoring a one hit KO with its Karate Chop technique. 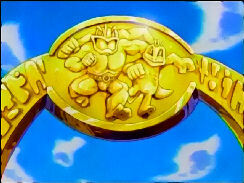 Satoshi sends out Kimori next, whose Dust (Pound) technique is able to wear down the fighting-type pokemon. Touki sends out Makunoshita, and despite the many powerful blows it is able to get it, Kimori is able to withstand it all. Suddenly, Makunoshita evolves into Hariteyama, who quickly takes out the severely weakened Kimori. Touki wins the battle, causing Satoshi to sulk for a bit until he realizes that Touki's surfing was a form of training rather than just goofing off. Satoshi resolves to spend some time on the island to train so that he can challenge Touki to a rematch. Dude! This episode was totally bodacious! I don't know why you dudes and dudettes are coppin' a 'tude 'bout Brawly's voice, cuz I thought it was rad! Now if you'll 'scuse me, I'm gonna ride this really gnarly wave and hang ten. SURF'S UP!!! 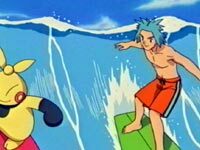 Really, if you didn't think that 4Kids would give Brawly a surfer's voice and add all kinds of surfing references in the script, you were in some sort of denial. I really wasn't surprised by the fact that he sounds like a certain orange-bandana'ed Ninja Turtle or that Dewford Island would be inhabited by stereotypical Californians. We only have two more episodes with the character, so I don't think it's worth getting upset over. The episode itself was fairly entertaining. I think it would have been great if the two Obaba (Brutella & Nastina) from Kanto were at the Rocket-Dan's restaurant, but otherwise it was great. A second is cut from the very opening shot, because seeing a closed door for more than one second would horrify kids into a coma. I think 4Kids was really bored when they did this episode, because they pulled a Make Room for Gloom on us: they added text where there originally wasn't any. The big archway in front of the Muro Gym didn't have any text on it originally, but 4Kids added the slogan "FIGHT THE BIG WAVE" underneath for the dub. The scary thing is that it looks really good, meaning that somebody must have spent a lot of time and effort on it to make it look like it was always there. So someone at 4Kids thought "Hey, that sign is blank. Let's spend money to add words there so we can show off just how much money we have to burn!" I guess painting away vaguely Nazi-ish stances and lengthening short skirts is too boring, so 4Kids has resorted to making up stuff to edit. A bunch of time cuts occur toward the end of the episode. The shot of Satoshi's face right before the scene changes from Touki's Gym to the Pokemon Center has a second cut from it. The subsequent shot of the Pokemon Center gets three seconds cut from it. A second from the panning shot right after the last commercial break is cut.